Fetlar has reasonable transport links with the rest of Shetland and beyond, but a degree of pre-planning will make your journey a lot more pleasurable. The first step, if it applies, is to find your way to the Shetland mainland. With frequent daily flights from the UK mainland, and an overnight ferry service from Aberdeen, you'll have plenty of options to consider. Read more about getting to Shetland. Once in Shetland, getting to Fetlar will require a road trip that includes two inter-island ferry crossings. 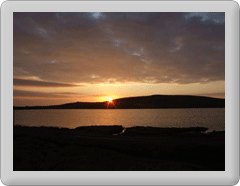 Read more about getting to Fetlar. Access by car using the ro-ro ferries is normally straightforward, but the ferries can be very busy, especially in summertime, so advance booking is highly recommended whatever time of year. Note that travel by public transport is possible, but only at a few specific times of day. When your planning your journey to Fetlar, why not also consider visiting our neighbouring "North Isles" of Unst and Yell . Both are readily accesable from Fetlar. The Fetlar dial-a-ride service is operated by R G Jamieson & Son, using the Fetlar electric minibus. To book Tel. 01595 745745 by 1630 the day before you wish to travel.